I first properly played football at 11 years old. Fourteen years later, through thick and thin, in sickness and in health, I love this game like no other thing I have ever loved. That feeling of that round, hexagonally-stitched ball on the curve of my foot is like a cool bath after a decade-long drought, a warm hug after years of isolation, a job offer after thousands of rejections, a book contract after even more rejections. Yes, a single kick is worth so much to me — an entire 90 minutes play is a rainfall of blessings from above. Because football is not just a game to me. Football has taught me some of the most valuable life lessons and brought me closer to my God. 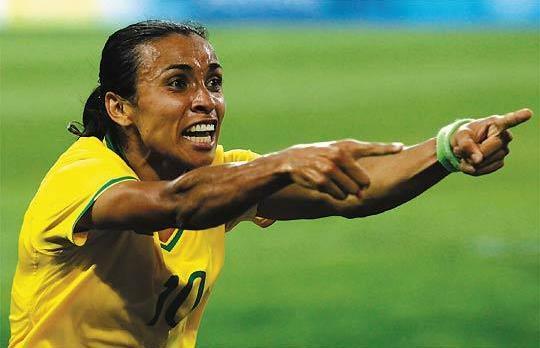 Marta, best female player in the world, shining. As a forward, you always risk making people angry. When you score a lot, you are hogging the ball too much, when you don’t score enough, well you aren’t winning games. At one point in my secondary school football career I scored 30 goals in one season (13 games). When I joined the national team shortly after the coach said: ‘even if you scored 30 goals on cones that would still be something.’ But during that season a close friend kept telling me, every game, that I hogged the ball too much. She said this with a mouth that looked like it was about to emit a wad of salty spit. Soon enough those words infiltrated me and filled me with so much guilt. I started to pass the ball more, in front of the goal. Actually, the goal became invisible to me because I did not want to risk being selfish. Even now on AFC Wimbledon, I would be in front of the goal with a clear shot and would hear my teammates shouting: ‘pass the ball’ as though they were warning of an impending bevy of armed soldiers. I have never been able to recover my hunger for scoring and my ability to just ‘go for goal’. And have thus realised the power of peer pressure and the power of jealousy and guilt. But jealousy is blind and negativity never comes from a place of pure concern. One should never pander to the negative peer pressure of others. You cannot love someone by pandering to their level of insecurity, you will only help keep them there and yourself too. In the face of discouragement and jealously-driven negativity, just keep scoring. Because love results in flourishing, not withering. Love must always encourage flourishing. Love must flourish. We must love ourselves, allow ourselves to flourish, to score goals, and this will allow us to love others so that they can flourish, so much so that they are no longer threatened by our flourishing. Even Marta has to defend. 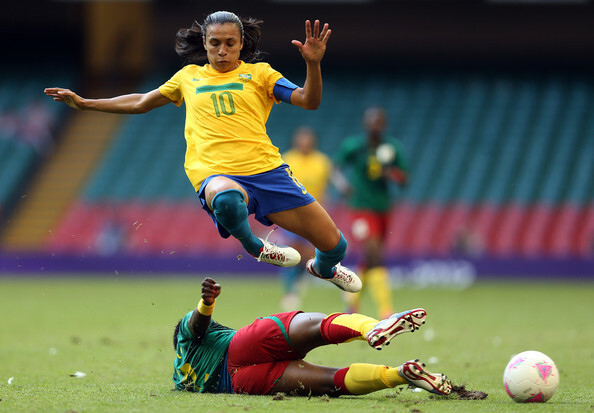 Of course Marta has to defend. We aren’t always able to score. Sometimes our roles will change. They will change momentarily when the other team steals the ball and starts to attack. We must defend. Defending requires a different mentality. It is not an explosive, single minded thing resulting in glory. No, it is something that calls for patience, concentration, communication and perseverance. It requires maturity and responsibility, and is driven by the desire to protect and dignify, to reorder and reform, to prepare for the glory to come — the glory of someone else, the one who scores. In a recent game with AFC Wimbledon we were losing to a team well below our level because two of our defenders were missing and the other team was just skipping through our defence. Out of desperation, I asked the coach to put me back there, willing to at least give it my all to regain some dignity. The other team didn’t score after I moved to defence and ever since then I’ve been playing last stopper. This is a great surprise to me. I never thought I would be any good in defence. So accustomed to scoring and ‘hogging the ball’ up front, I wasn’t always the best at defending. And for years I didn’t really appreciate how important it was to stick to a player and not give up when defending. But this season I have had the chance to take that responsibility and it has been so great that I cried with emotion. Because now that I am older I don’t desire the glory and fame, I want mostly to be dependable, consistent and responsible. And defence gives me all of that. I am now being told that after 14 years of playing football defence is actually my position. I am extremely proud to say that I don’t ‘dive in’ anymore and this perseverance, patience and maturity has filtered into every other aspect of my life including my job, my relationships and my faith. Because sometimes we just need to defend. The heart, not the core, is the engine. You must first win the 50/50 balls. I just finished watching the current Trinidad and Tobago U20 national women’s team lose a place at the world cup because they ‘lost their legs’. They were 3-1 up and they let Costa Rica surpass them by 5-3. From the second half every ball was won by Costa Rica, they didn’t stop running, they didn’t stop playing smart, they played the ball to feet and eventually, I would say inevitably, won. This also happened with an AFC Wimbledon game where the team we played was no where near our level but they had so much heart it was unbelievable. They won every 50/50 ball, as in EVERY one. And eventually, inevitably, they won. And it was an FA Cup game. We lost the chance to play Chelsea or Arsenal because of a crap team that had more heart than us. Talent? What is talent when you have no passion and heart? What is talent when you have no focused desire to use it and to win it? If you don’t get to the ball first how will you use your talent? In football and in life you have to want to get there first if you want to have the opportunity to win or succeed at anything. Marta has a bit of a temper, unfortunately. If you raise your voice and adopt a harsh tone you are always in the wrong. Communication is pivotal in football so a team or a player that speaks harshly or gets openly angry with their/her teammates is set for failure. The teams that work together, encourage each other and guide, not command, are the ones that do well. When I first joined AFC WImbledon my coach told everyone that I would win games and when I joined the national team they told me I was going to be the next Cindy Parlow. What they didn’t tell me was that it would take 11 players, playing together, supporting each other to their strengths, to win games. No matter how well I defend if there isn’t a forward to receive the ball and go to goal then it makes little difference. No matter how many runs I make, if there isn’t a defender to pass the ball to me or anyone to support my play then I am useless. It is cliche, but there is no ‘I’ in team. The coaches who focus on individual players run the greatest risk of developing egos not a winning team. It is so important to encourage people in their strengths, tell them when they are doing well, and pick them up and advise them when they aren’t. No team ever won a match with only one great player. The same way nothing in this world has ever been changed by just one person, he/she always needed a following. Even Jesus. If Paul and the disciples and all apostles thenceforth did not work to keep the word of God alive in people’s hearts then I wouldn’t know Jesus today. I had to mention his name in here, always do. But yes, we are made for companionships, to be in teams and to work together to compliment each other’s strengths. So we must always seek to encourage and appraise the effort of others and ourselves and never think of ourselves as more important than any of the other 10 members on the pitch. This one might come as a shock. And many might protest to it. But a very crucial thing I have learnt from playing football is that we must not let our ambition to be the best or meet the expectations of others steal the joy we get from the things that we love. I love football to an extent to which I cannot describe. But there have been times where the wear and tear I got from pushing myself across the line in the hellish 120 sprint test and the anxiety I felt as a result of the pressure I put on myself to perform and the weight of disappointment when I didn’t completely sucked all life out of the game for me. I believed that I was a failure despite playing internationally and on a division one football team, having only started playing at 11 and only being trained professionally from 16. I thought I was a failure because I never passed 120s or never became Cindy Parlow or never yet got MVP for AFC Wimbledon. Such poor feelings towards myself blurred my memories of the endless fantastic moments I have had as a football player, the moments of glory and the moments of overcoming adversity, and the moments of winning, and the moments — the most important ones — of laughing and smiling while playing. For two years I stopped playing because I didn’t want to develop a manly body in my late 20s and I disliked the politics of the national team and my university team. But listen to me. We have ONE life. And this life is a true gift from God. Don’t ever let anything steal the joy you get from doing the things that you love. Rather, sacrifice your ambitions, not your joy. NEVER SACRIFICE YOUR JOY. I have so much more to say but I will keep it for another blog. THANK YOU HEAVENLY FATHER FOR FOOTBALL!